• 14k diamond cut cable chain in 18” or 20”. 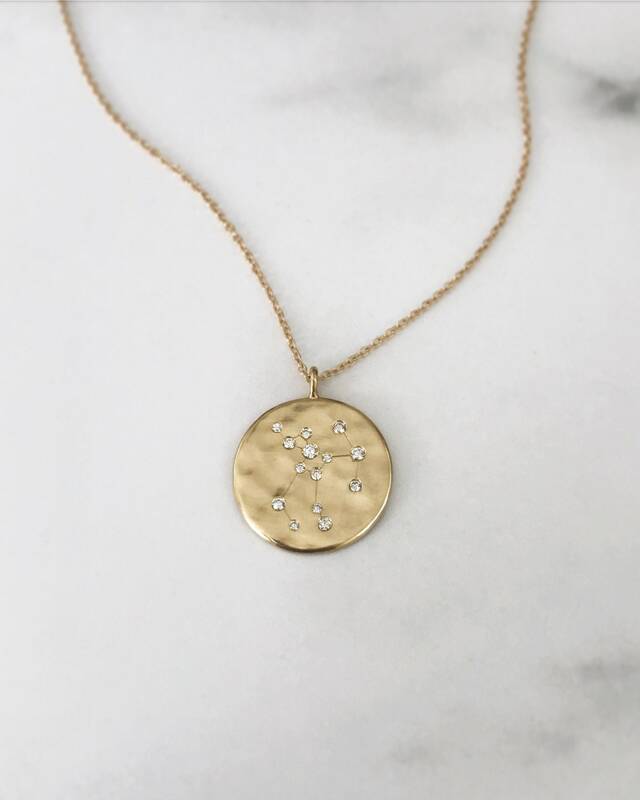 • Zodiac constellation in genuine diamond. • Other chain lengths available upon request. 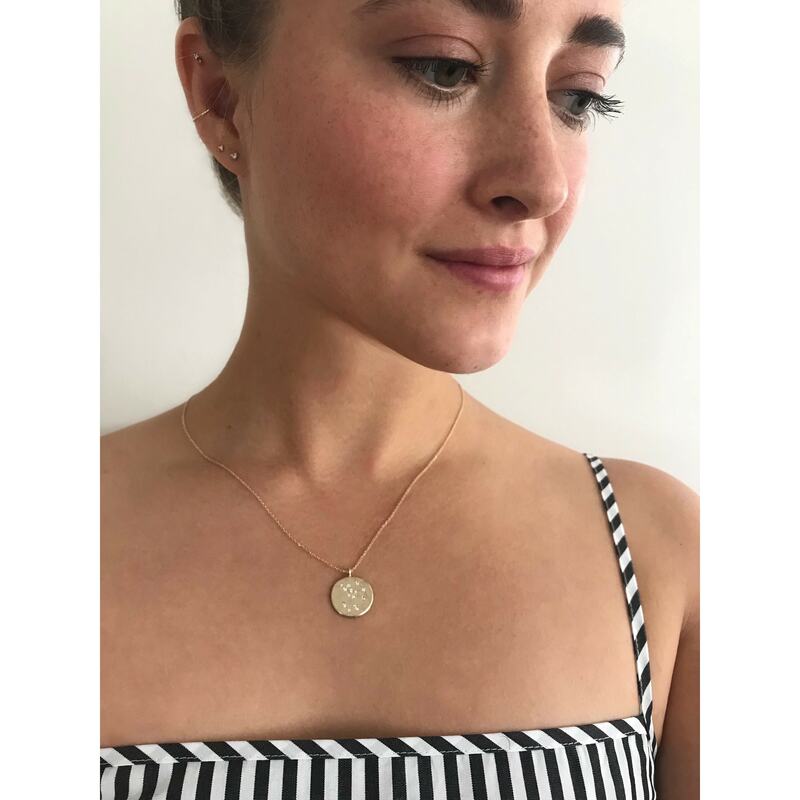 Everything is handmade by Allison Hall in Santa Monica, CA and is customizable. Please email info [!at] allisonhalljewelry.com. Most orders are shipped through USPS Priority Mail. Engagement rings are shipped via FedEx. Many items are made to order and are therefore customizable but do take a couple of weeks. If you have a deadline, I would be happy to work with you, just let us know ahead of time. I am happy to ship anywhere in the world! If you would like a price for international shipping or expedited shipping please send me a message. We will get back to you quickly. Thanks so much for supporting my work! I want to be sure you're completely happy with your purchase, so if there is ever a concern once it arrives please contact me. I'm happy to help! All items are covered under a craftsmanship warranty for 1 yr. This does not include abuse or abnormal wear of an item. Items may be exchanged within one week. Please contact me upon receipt of your piece if you would like to exchange it for something else. Custom orders are final sale; However, I want you to love it so please do not hesitate to reach out if there is something you would like changed. Please contact me with any questions. I love to make you happy. All items listed can be altered to have different stones or materials. Send me a message and lets talk! Is there a picture of something you love but you want to make a couple edits to? Are you looking to design the perfect engagement ring? I would be happy to work up a sketch, a model, and then the final piece with your input all the way!